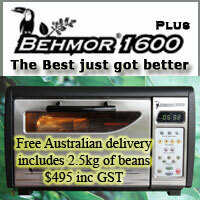 Roasting is a far simpler process than many make it out to be. Take your time, take lots of notes so you know what you did and can repeat it, taste what you produce (over a number of rest days) and try to only change one thing at a time in your roast process so you can identify what the change did to the taste. 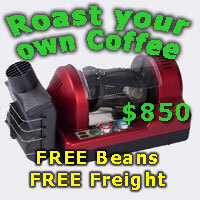 Goldilocks roasting is also worthwhile for a bean you don't know. 3 roasts - light, medium and dark. Taste 'em. You should narrow down the "target band" pretty quickly and then make the above single change at a time to understand the effect (good or bad). There is no right or wrong, the beauty of home roasting is that you only have to produce something YOU like (okay, maybe the spouse too) but in no time you have a library of knowledge that allows you to attack any bean with confidence that you'll at least produce something "nice". coffeechris, greenman, simonsk8r and 3 others like this. When you say taste them, are you referring to cupping? or in a proper espresso/pour over? do you wait a few days to let them settle first? Taste them how ever you want! There is no right answer except what works for you. I can probably find an web reference from a verbal "egg spurt" who will demand it is always cupped under a full moon at 34.5 hours rest time in a white cup pre-heated to 32.7 degrees and tasted with a warm silver spoon. Hogwash. Some people like to cup them, many prefer to make it as they intend to drink it as it's an easier reference point and at the end of the day that's how they are going to drink it anyway. Rest time as mentioned in the first post should be over a number of rest days. 1 day, 2 days, 10 days, 20 days... whatever you like, no rules. It's all part of your notes that will determine when the coffee developed and when it started to stale. Don't over complicate the process but do take lots of notes along the way which will in time become your reference point for attacking a different bean. dan77, Dimal, greenman and 6 others like this. Very well said mate, it's really comforting especially to newer roasters to learn that it can be a much simpler process than it can be made out to be. Can seem sooo overwhelming to many, but in the end you once said awhile ago that roasting is just heat and agitation. And very often we can get stuck in a "he said, she said" mentality, and fixate on a particular article, video or expert opinion, but I'm learning very quickly that it really has to suit you and your setup. Take notes, for sure it's cool to ask for advice, but making sure it's relevant to you is important. Andy, Dimal, greenman and 3 others like this. I've always maintained, if you can successfully cook/follow a recipe you can roast coffee, it's not the complex process some try to make it out to be. Last edited by Yelta; 1st December 2018 at 10:02 AM. Andy, greenman, solace and 1 others like this. Something i struggle with (in addition to the roasting), is inconsistent brewing. Would a "cupping" style critique of roasts provide a more even playing field than brewing to drink in this case? I have a relatively cheap grinder which has an off centre cone burr (following a failed replacement of burrs), i get a large range of aggregate size which must translate into inconsistent extraction, i'm definitely not getting all the nuances of flavour someone might using a more accurate grinder. I'd be interested to hear what the pro's think on this topic too. sorry for slightly OT post. Cupping just tends to be a standardized protocol and level way of testing out roasted coffee amongst professionals. A way of assessing coffee in a more standardised way. It's useful for sure, but I'd say use a brewing method that you're familiar with and would drink often. That way you have a particular baseline that's relevant to YOU. And yeah making sure you have a consistent brew is really crucial too. Otherwise you could be extracting different amounts at different times and not able to properly taste and assess any changes in your roasts. But curious what others think! greenman, simonsk8r, solace and 2 others like this. Concur wholeheartedly, a good grinder is a crucial factor in the whole process!! Come on Mrs Janus, it is almost Christmas, it would make a nice stocking filler!!! simonsk8r and Janus like this. Something i struggle with is inconsistent brewing. For sure, you need to keep your variables to a minimum to truly taste a roasting change. Sounds like a sales pitch (because I sell them) but the Brazen is an awesome device for doing the same thing over and over. Same 92C water temperature, same 45 seconds pre-soak. Half batches are 600ml of water, 40g of coffee (slightly coarser than plunger grind) and it's far easier to taste differences (and faults). I use the Brazen way more than I use the espresso machine now, perfect in a travel cup on the way to work and the same insulated travel cup follows me around all day at work too (got one in front of me now). ...and yeah, a good grinder makes a big difference to all brew methods. Put that the highest on Santa's list. Dimal, Javaphile, Janus and 1 others like this. Although I have had the 2nd hand Hottop for a little while, it was only today that I finally roasted beans. It being the first time I had roasted a bean at all, and to be systematic about it, I decided to run a roast strictly on Hottop's Auto program while observing it, just to note how it adjusted parameters and to see the process in action. There was a slight glitch after I had put the beans in, when it sank in that the cage was not turning, so I ejected, reseated the cage and started again. So, yes, roasting is easy. Ya push da button and ya wait for da beans. Next, I will try for something manual and meaningful. These ones will be tasted in a few days. At least they will be known to be fresh. Fellow 2ndhand Hottop user here. Up to roast 7. I'm finding that I'm generally ejecting when ET is anywhere from 206 to 210. Any other Hottop users who have roasted with a higher ET than 210 with a good outcome?